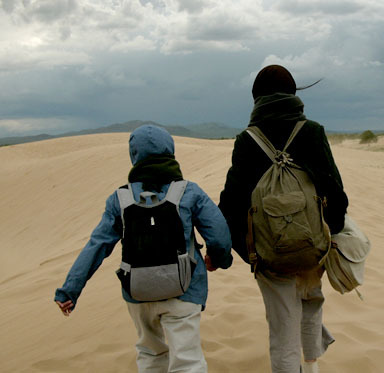 Korean-Chinese director ZHANG Lu’s third feature Desert Dream (Hyazgar), picked up the top prize at the 9th Osian’s Cinefan Festival of Asian & Arab Cinema held annually in New Delhi, India. The Korea-France co-production took home Best Picture in the Asian and Arab section at a July 29th awards ceremony, closing the fest’s 10-day run. Desert Dream is set in a small, drought threatened village on the Chinese-Mongolian border and revolves around a farmer obsessed with tree-planting to stave off desertification. After his neglected wife and child leave him, a North Korean woman refugee and her child, wandering across the desert, stay and settle with him. A wandering soldier also appears on the scene. ZHANG’s film premiered in competition at the Berlinale earlier this year. It went on to tour a number of festivals before winning its first prize at Osian. ZHANG’s sophomore work, Grain in Ear (2005) travelled to numerous film festivals, including Cannes, winning the top award at the Pusan International Film Festival in 2005.